Regenepure DR + NT + Biotin Conditioner + Minoxidil 5% Spray + Hair Supplement. 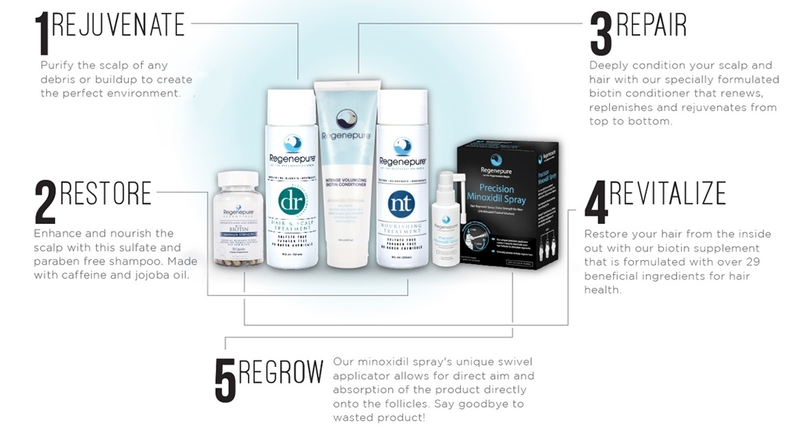 This Complete Regenepure System is everything you need to fight back against hair loss, both internally and externally. Don’t wait for the perfect moment to regrow your hair – the perfect moment is now! This Complete Regenepure System is everything you need to fight back against hair loss, both internally and externally. Start off with Regenepure DR, a powerful ketoconazole shampoo that removes the buildup of DHT in your hair follicles to unclog and reset your scalp’s environment. Then, use the NT, which acts as a nourishing treatment that uses its special blend of ingredients, including caffeine and jojoba oil to stimulate the hair while cleansing it in one step. Once you rinse the NT out, revitalize your hair with our Intense Volumizing Biotin Conditioner, which is packed with beneficial nutrients such as tea tree oil, keratin, silk proteins and copper peptides to restore, rejuvenate, and volumize your strands. Afterwards, make sure to use FDA-approved minoxidil to target those bald spots you want to cover. Our unique swivel applicator allows for direct targeting of areas you want to grow hair. Now you never have to worry about wasted product again! To amplify results, make sure to take our Biotin Supplement daily. The supplement is packed with 29 hair revitalizing ingredients. From apple polyphenols to zinc, saw palmetto extract and fo-ti root, your hair will be healthy, conditioned, and thick with continued use.